Welcome to Waterfiltercrock.com! Featuring Smyth/Cid Water Filtration Crocks: handmade in Upstate New York. Our American made filters remove bad taste, odors, bacteria, aluminum, arsenic, chlorine, fluoride, lead, mercury, nickel, VOC’s, pharmaceuticals, and more! Are you concerned about the quality of your municipal drinking water or well water? Remove impurities with our gravity-fed water filtration systems. Great for lake houses and cabins that need to filter water from ponds and streams, or for emergencies where running water and power are unavailable. 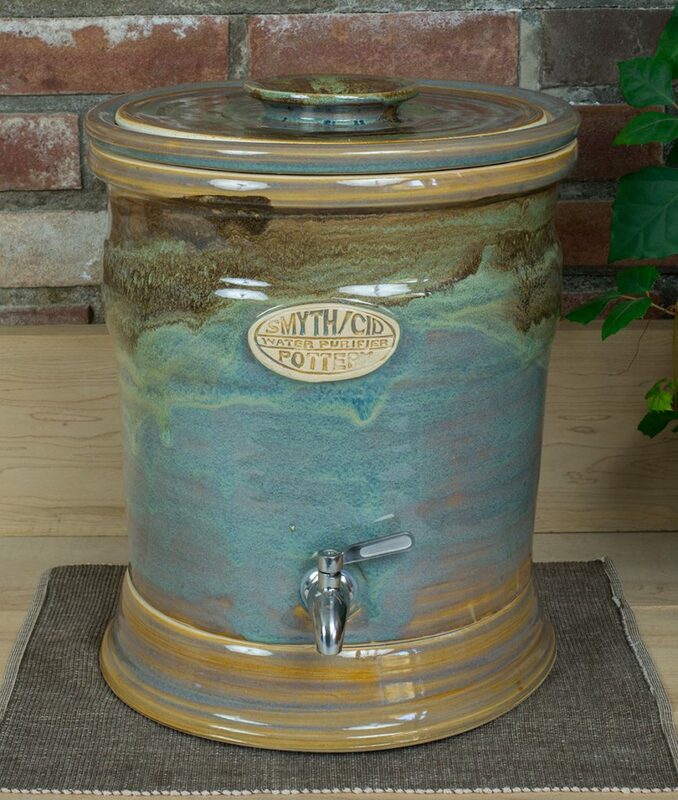 The "Caspian" hand crafted stoneware water filter crock makes a great centerpiece for your kitchen or dining room. The Caspian model is designed to slide underneath kitchen cabinets. Gravity fed filtration system: enjoy pure water on tap, anywhere in your home. No power or running water required. Great for lake houses and cabins, for filtering pond and river water, for emergencies, or for removing what municipal water companies miss. Your choice of 4 glazing styles. Your choice of hand-forged steel or ceramic stand for easy dispensing. *Dimensions are approximate. Each crock is hand made to order, resulting in subtle variations.